Whether you’re seeking beautiful but inexpensive wedding dresses or eco friendly bridesmaid dresses, there are numerous ways to save on your wedding dress and the entire wedding itself. You don’t need an expensive wedding to proclaim your committment to your partner. Here are some money saving tips that will keep the wedding within your budget and still be classy. You can save money on your wedding by limiting the number of guests who come to your wedding. You can invite mainly your relatives and closest friends to the wedding. Those who you do not invite can receive pictures and videos of what happened on your big day. Another money saving tip is to seek out ways to buy your wedding dress and others’ dresses inexpensively. You can find cheap mother of the bride dresses at thrift stores but be sure to inspect them before making a purchase. You can also buy your wedding gown on sale from places such as the department stores, local bridal boutiques and even at estate sales. If your sibling’s or mom’s wedding dress is stylish enough for your preferences, wear this on your wedding day. Renting a dress also saves you money. Add an eco-friendly touch to your wedding by using flowers from your own garden to create bouquets and floral decorations for the reception. Another way to save money on wedding flowers is to decorate with flowers that are in season. Supermarket flowers look just as beautiful as the expensive ones, and they are on sale throughout the week. What About the Reception Venue? Who says you need to have the reception at a venue?. As more brides turn to eco-friendly weddings, take advantage of this trend by holding it at at a local park. This is especially a great idea if a few kids will be at the reception. The kids can play with each other while the adult guests socialize. To save money on pictures, have some relatives serve as your photographers for the big day if they take great pictures. They can use high quality digital cameras or their smartphones. Another option would be to hire a college student who offers photography services at a discount price. Spring and summer weddings are not only popular but expensive. 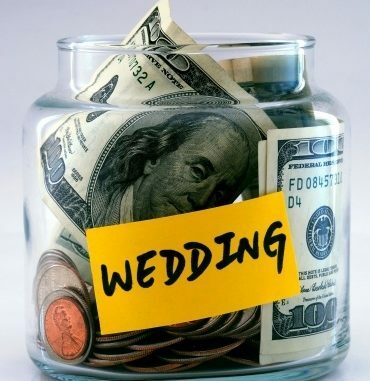 If you want to shave off dollars from the budget, hold the wedding during the late fall and early winter months. Also consider holding the wedding on an unpopular day such as Sunday or Wednesday. Thanks to Youtube tutorials, it is now easier to learn new and simple makeup looks and hairstyles suited for weddings. Save money on a trip to the salon by doing your own hair and makeup. Or you can get a talented relative to pull off the look you want so that you will look your best. Contact different collegiate music departments and inquire about hiring music students to provide the music at the wedding and reception. A live band is pricey so it would be better to hire an affordable mobile DJ. Be sure that he knows the kind of music you want at the wedding. In conclusion, these tips keep you from spending too much money on your wedding and reception. Then you can focus more on preparing for the lifetime of marriage that will occur long after the wedding ends. You’ll be less stressed and the money you save can go towards saving up for starting a family or buying a home. As for the honeymoon, be a tourist in your hometown. Check out any local free events and stay at a local hotel.